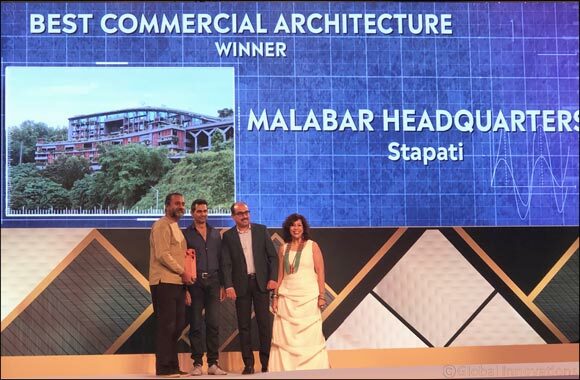 Dubai, UAE, April 14, 2019: Malabar Group, a leading business conglomerate from India with presence in 10 countries and the parent company of Malabar Gold & Diamonds has bagged the recognition of having the ‘Best Commercial Architecture' for its Headquarters (M HQ) situated in Kerala, India. The Special Recommendation award was won at the Forbes India Design Award 2019 in the event held at Mumbai, India. Ar. Tony Jospeh, Principal Architect, Stapati who designed the Malabar Group Headquarters (M HQ) received the award from Ar. Sanjay Puri, Principal Architect, Sanjay Puri Architects and Ar. Sonal Sancheti, Principal Designer, Opolis, in the presence of Mr. Subair MP, Deputy Regional Head, West Region, Malabar Gold & Diamonds. The picturesque global headquarters of the diversified Malabar Group, at Kuttikattoor, Calicut, Kerala, India houses all its subsidiaries including its flagship brands like Malabar Gold & Diamonds, Malabar Developers, Malabar Watches, Eham Digital, etc. The Forbes India Design Awards is a national award which honors the people who shape India's vibrant architectural and design landscape. It celebrates the best talent in the Indian design industry. Drawn from the worlds of architecture and interiors, they recognize a spectrum of architectural and interior practices in India that have evolved to match the best in the world. Covering a range of categories, the awards offer architects and designers a prestigious platform to communicate a shared vision for the future, from culturally integrated city skylines to sustainable urban communities. The Forbes India team has put together a judging panel comprising of the most extraordinary individuals that have shaped Indian architecture and design milieu.